Blink Contacts moisturising eye drops provide quick relief from unpleasant dryness, irritation, and fatigue by instantly calming, refreshing, and regenerating eyes. These drops are designed for use with all types of contact lenses, and also alleviate symptoms associated with dry eye syndrome. 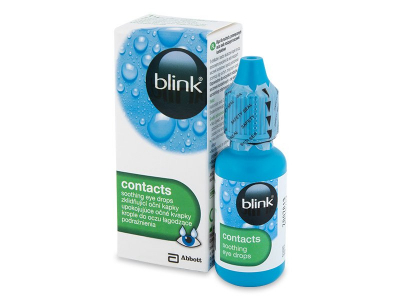 Blink Contacts drops are ideal for contact lens wearers, as they can be applied directly to the lens. Using Blink Contacts drops aids in the safe and effective removal of lenses, and they can also be applied to eyes or lenses prior to inserting lenses for added comfort. Apply 1–2 drops to each eye and blink several times, as needed. The manufacturer recommends Blink Contacts eye drops be consumed within 45 days of first opening. After this time, the remainder of the solution should be discarded to prevent contamination.